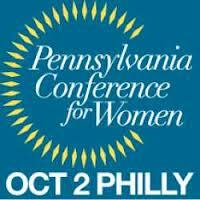 The Pennsylvania Conference for Women was exactly the shot in the arm of motivation and inspiration that I needed. 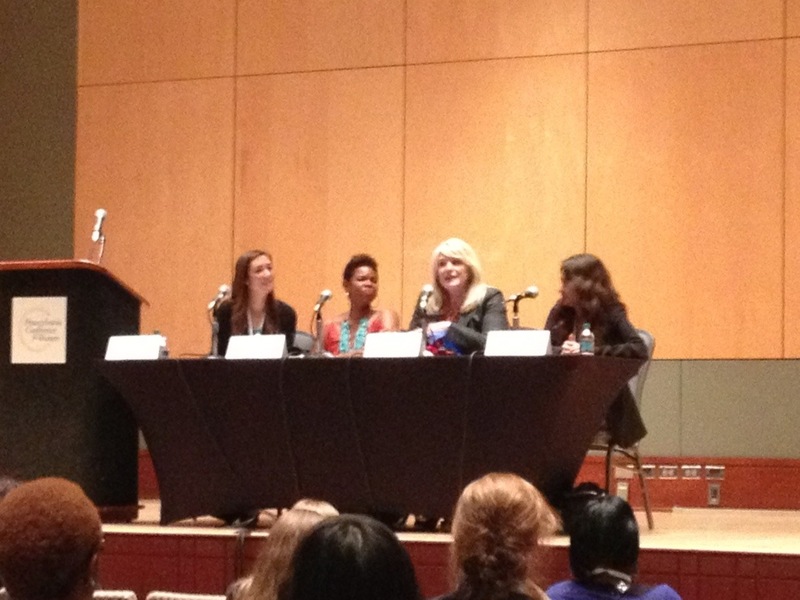 At PennWomen, amazing, powerful and INSPIRATIONAL women shared their insight for making the most out of your career and your life. This conference was all CONTENT CONTENT CONTENT. It was quite a lot to be packed into one day, and far too much for me to recap effectively in a blog post. The morning kicked off with Charlotte Beers, advertising executive powerhouse and former Undersecretary of State for Public Diplomacy and Public Affairs. She shared the story of her ascent to success, and explained that in the business world, women need to focus not on acting “womanly” but instead focus on being “leaderly.” That, yes, there are differences in how women and men perceive and do things, but for career success, a woman should approach challenges from a perspective of leadership and fearlessness. I know a number of the keynote speakers were recorded, and I really hope that Charlotte’s talk is shared on the website, because it was phenomenally inspirational. I also loved the panel discussion between Alexis Sclamberg, Trenesa Danuser, Brenda Dennis and Lauren Berger about defining “success” for yourself. They discussed how success is a personalized definition, and steps that they have taken to reach their career goals. Trenesa, an executive with Estee Lauder, gave some phenomenal insight into how to balance family with a high-powered position that requires frequent international travel. My biggest takeaway from that panel was when Alexis shared that she has attended numerous conferences full of super-power executive women, and even they, at the highest rungs of business, don’t feel like they have made it to success. Those words made me realize how success can’t be an end goal, it has to be a process or a state of being. Cathie Black and Emily Bennington’s discussion on “Executive Presence” was also amazing. Cathie emphasized the importance of appearance– that you must look the way you want to be treated. If you want to be treated like a professional, you must dress like a professional. This is an issue I’ve been working on lately. I have a terrible habit of picking out my outfits in the morning when I am exhausted, and the only thing I want to wear is yoga pants and a hoodie. Although I manage to pick out passable attire, it’s not nearly as polished as the presence I would like to project. I’m making a habit of keeping my nails polished, and I need to pick out my outfits before I go to bed at night, when my energy is (marginally) higher. Cathie emphasized that when things get tough, put on some lipstick, because that’s when people are going to be watching. She also pointed out that women have a “gratitude problem.” I know that I am completely guilty of this. Women who ascend to a new position or meet a goal get wrapped up in being so grateful for getting there that they stunt their forward progress. Men, however, tend to meet that goal and immediately ask “ok, what’s next?” As women, we need to work on always looking forward, and not letting ourselves fall behind by getting so wrapped up in reaching the previous goal. Tory Johnson and Barbara Bradley Baekgaard chat about Baekgaard’s founding of the Vera Bradley company. 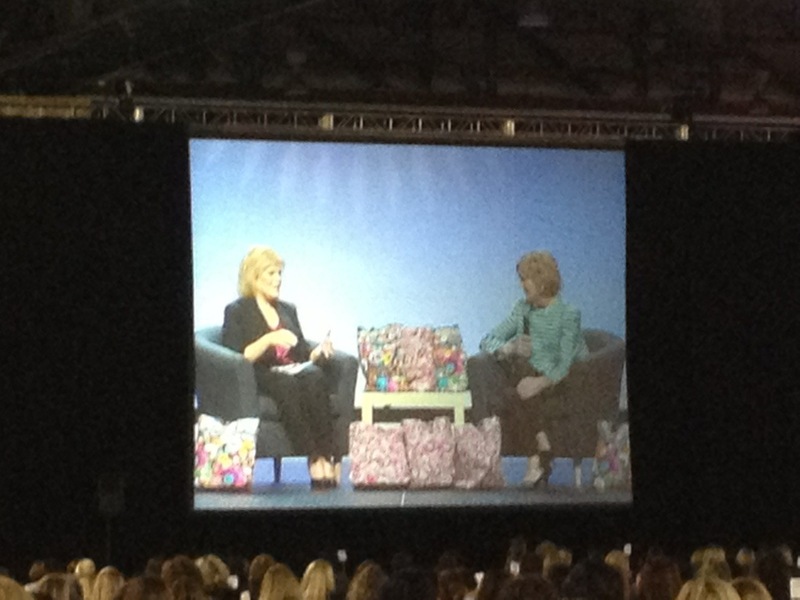 I felt like I had so much more in common with the women at this conference than the women at BlogHer. 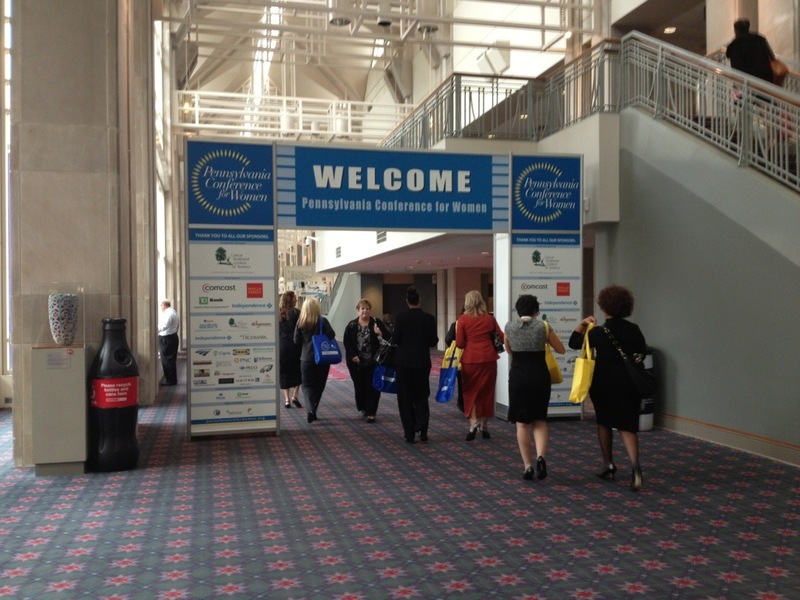 PennWomen is a career focused conference, and I’m definitely a career focused person. I definitely will attend next year (and the year after and the year after). The only downside I saw to the conference was that there was so much amazing content, it was hard to find the time to really get to talk with people. I think this conference would really benefit by a short speed networking session in the morning, where we can all have an opportunity to quickly meet people and exchange cards. The short period before the opening keynotes was intended for networking, but I’m sure I’m not the only one who finds it remarkably intimidating to go into a room full of literally thousands of people and just start chatting it up. Speed networking would be awesome. This conference is an amazing experience, and it would be equally beneficial for men as for women. It is a jam-packed day, but it will motivate and inspire you like nothing else. On my drive home, I was full of energy and ready to go! I was ready to TAKE OVER THE WORLD!! Of course when my alarm went off the following morning, the energy had faded, but a number of the meaningful takeaways continue to bounce around in my head. 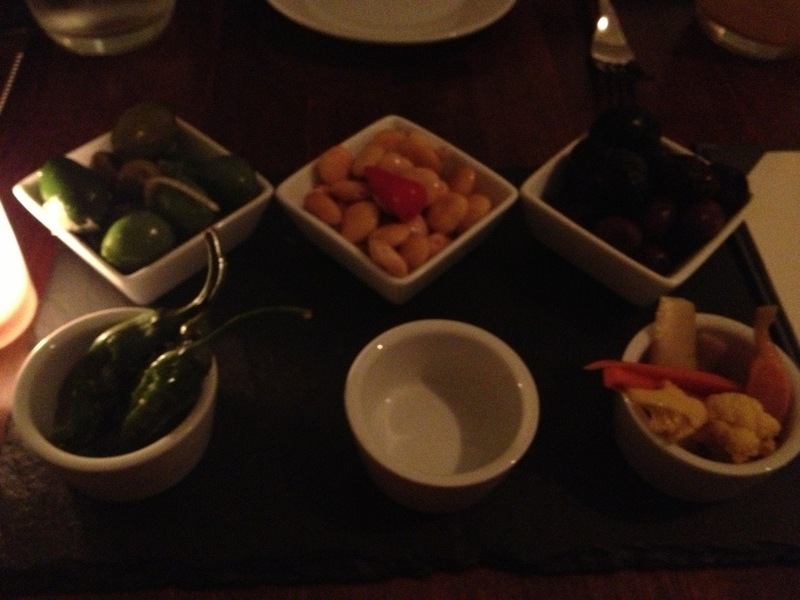 A few years ago, Sandy and I went to this AMAZING vegan gourmet restaurant in Philly called Horizons. Seriously, the meal there was up in my top 10 list of best meals I’ve had. Then Horizons closed, and it broke my heart. 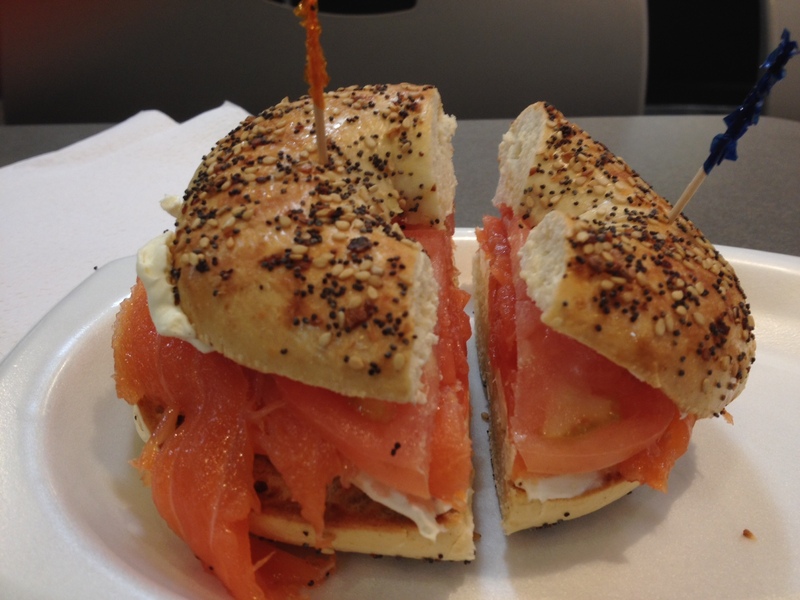 But then, the owners opened a new enterprise– VEDGE in Center City. People look at me in surprise when I put the words “vegan” and “gourmet” together. I suppose people equate vegan foods with salads and gritty lentil dishes, but Vedge proves that vegan cuisine is so, so much more than that. 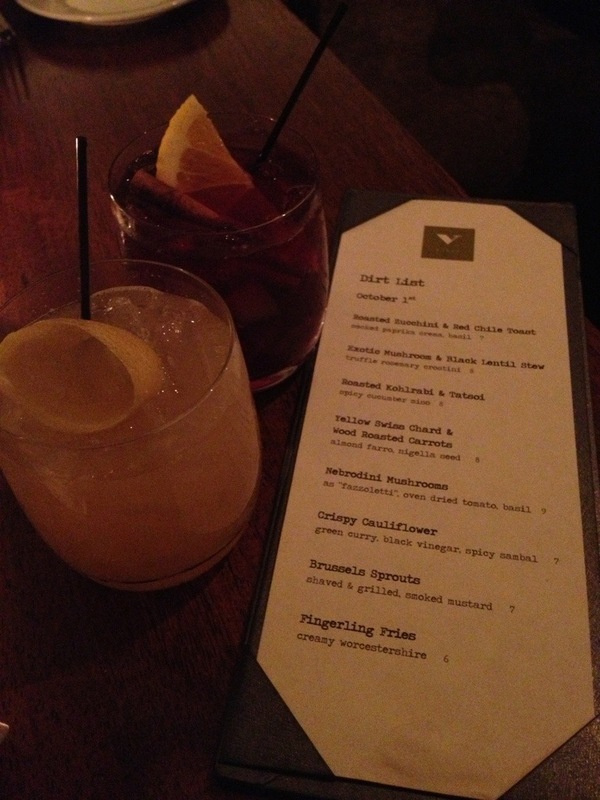 My friend Aubrey and I ventured to Vedge on Monday evening. I took pictures of our selections. 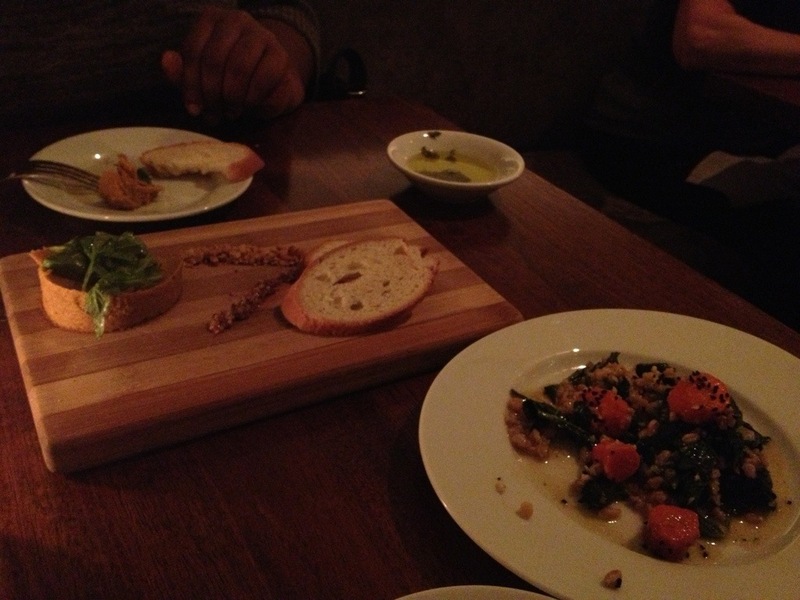 The shame is, the photos do not adequately convey the amazingness that are Vedge’s brilliant dishes. 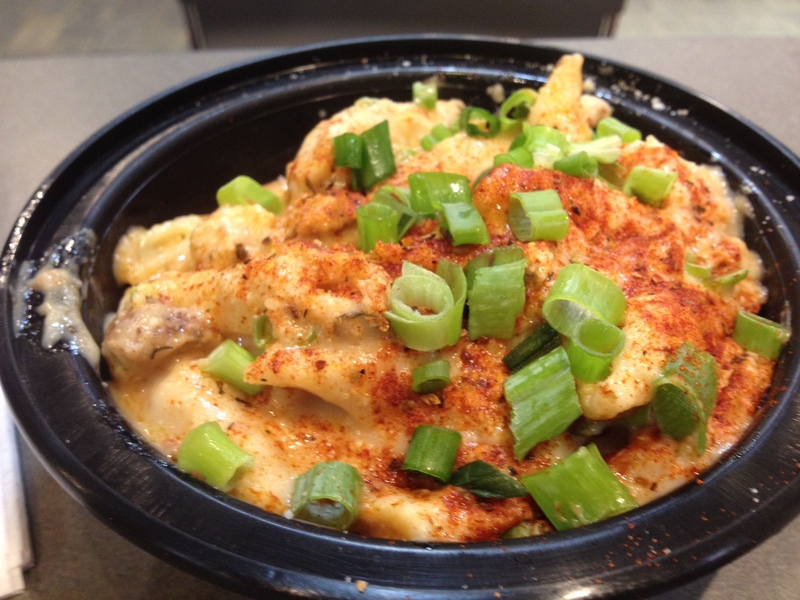 The flavors are so savory and complex. The textures are phenomenal. Amazing, simply amazing amazing amazing. 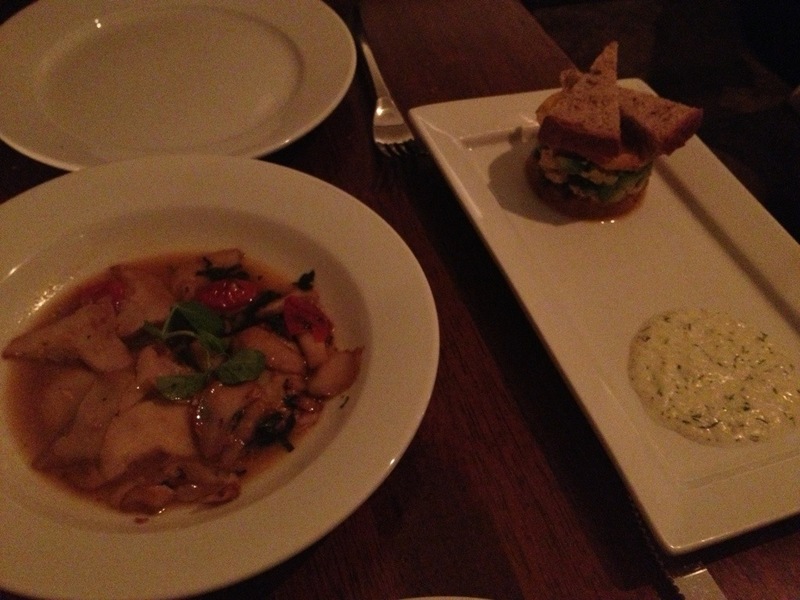 These dishes were the true standouts of the evening! 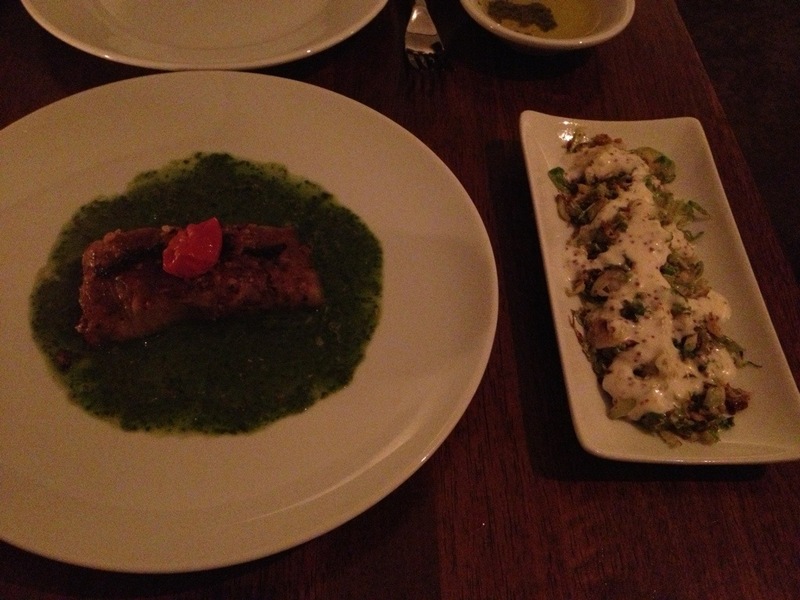 On the left is eggplant brasciole– hearty and savory and perfectly seasoned! On the right are brussels sprouts. When the dish arrived at the table, I was disappointed by the appearance. I thought it was going to be some blah brussels sprouts slaw. Oh NO. These are AMAZING. They’re shredded and roasted and smokey and perfect. I could eat these two dishes all day, every day for the rest of my life. The prices were reasonable for a truly gourmet meal. Despite our meal containing no meat, dairy, or eggs, we were truly stuffed when we left. Vedge is perfect for a date night, or just a special meal. No joke, I’d drive all the way back across the state just to have another meal there. 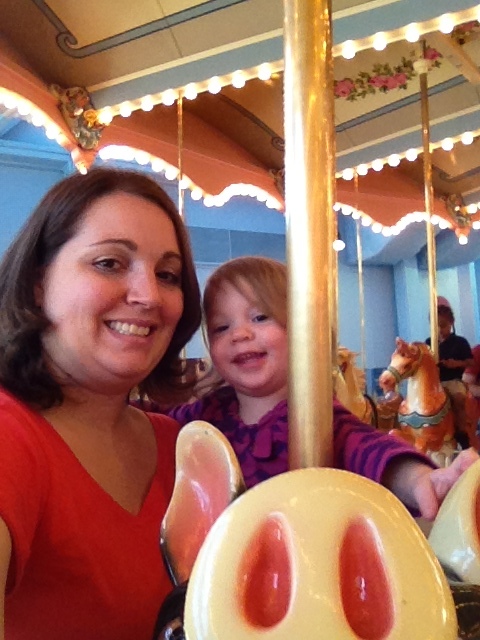 I just got back home from the Pennsylvania Conference for Women– what an AMAZING experience! 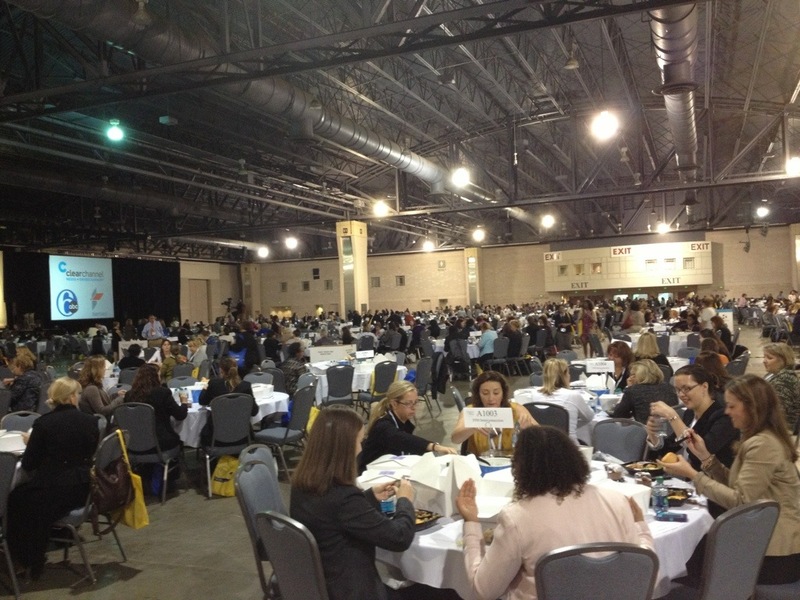 I’ll have more to say once I’ve had a few minutes to collect my thoughts, but for now suffice it to say that in comparison to the BlogHer conference when I felt like I didn’t quite “fit in,” the women at the Penn Women conference are exactly the kind of women I seek to surround myself with. These women are intelligent, ambitious and driven. They take their careers seriously, and strive to be leaders and mentors. What an inspiration! The biggest treat of the day was Sonia Sanchez sharing her poetry. Her poetry stars as a story, then the words surround you, and you see every word she speaks. Her art is so beautiful. You sell yourself first, your company second, and your product third. Your failures may be precisely what you need in order for everything else to go right. Make the best first impression, you do not have an opportunity to make a good second impression. Guard your reputation, it is your life. One of the gifts of a bad economy is that we are forced to be really creative. What happens to our best work in the world really isn’t up to us. You have that moment where you have a weight to lift that is unbearable. And in that moment, you have two decisions: You either lift it, or you don’t. Learn to speak clearly, memorably, and persuasively. Leadership is having the quality of persuading others to follow you. You are not the same person at work as you are at home. Accept that and be liberated. Hello City of Brotherly Love! I arrived in Philly last night. I worked in my firm’s Philly office today, and tomorrow I’m off to the Pennsylvania Conference for Women! YAAAAY! I’m super excited! I’m staying with a friend from law school, and when we arrived last night, we stopped for a drink and a bite at her neighborhood bar, The Devil’s Den. They have an impressive selection of beers on tap, and tasty tavern food. 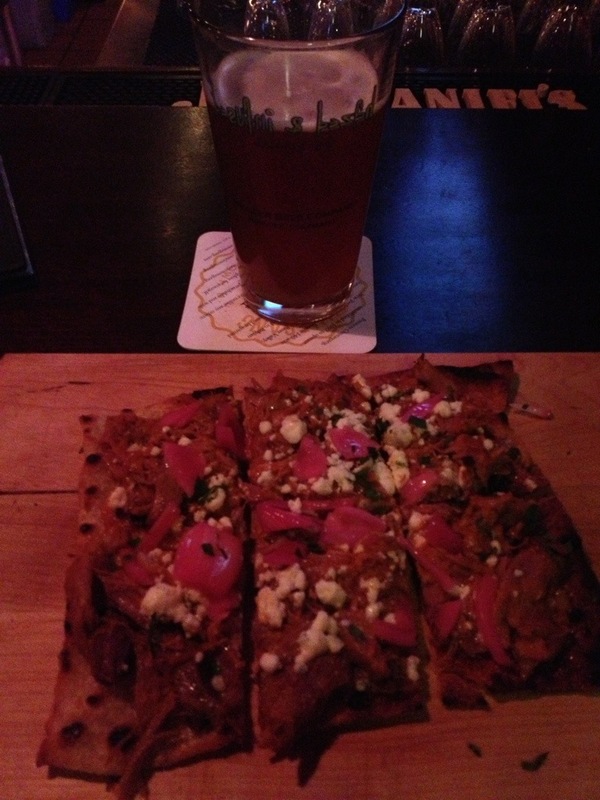 Spicy BBQ duck flatbread and a pumpkin ale! 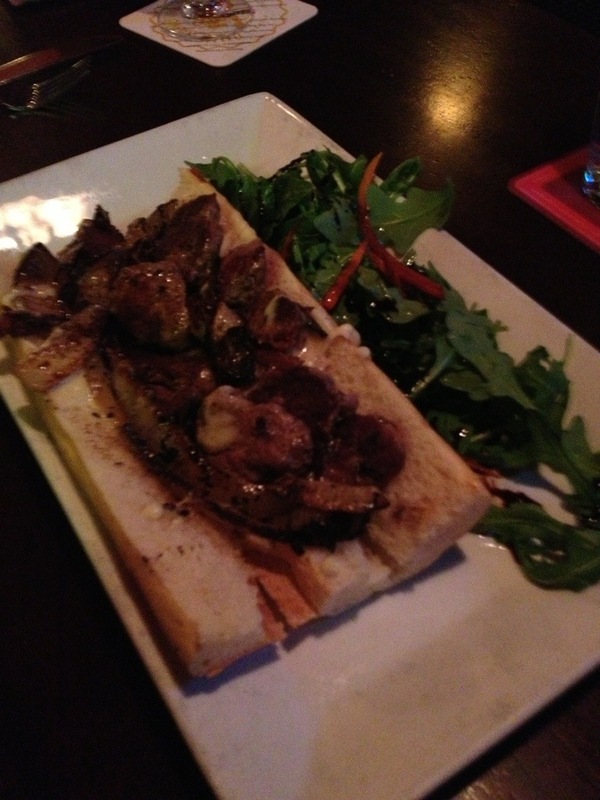 Philly Cheesesteak– this was really excellent! I have never really had a “neighborhood bar” where I’ve been a regular. The closest I’ve had to that is maybe when I took up residence at various Pittsburgh coffee houses while studying for the bar exam. I am also so obsessed with trying out new places that it doesn’t leave much time for returning to the same place over and over. Are you a “regular” at any particular restaurant or bar? What watering hole do you call “home”? I’ve had a BUSY week, and I was itching for a vacation. I had a list of things I had to accomplish at work on Friday, and when I wrapped them up around 3:15, it was all SCHOOOOOOL’S OUT FOR SUMMAH! Except it’s really just out until Monday. Mr. Beez arrived here on Wednesday to attend the CCMA conference, and Baby Beez and I arrived here last night to spend a weekend visiting friends, and eating thirty thousand calories a day of Philadelphia’s finest vittles. We are staying at the Marriott, which is directly across the street from the Reading Terminal Market. PERFECT! We got in late last night (around 9:30) and I was starved. We went for a short walk, and discovered More Than Just Ice Cream. I was so hungry that I DIDN’T EVEN TAKE PICTURES OF MY FOOD! Oh the humanity! Anyway, I had a grilled cheese with tomato and sweet potato fries. There wasn’t anything fancy about my order, but it was definitely solid. I ordered Mac and Cheese for Baby Beez. She was being a pain, refusing to sit and wanting to destroy everything, so I ate more of her meal than she did, and it was definitely good. Mr. Beez had stir fry and it was full of a huge variety of fresh veggies and tofu. They don’t mess around with fancy plating techniques or exotic flavor combinations–this is basic, delicious, comfort food. I, of course, could not pass up the ice cream. 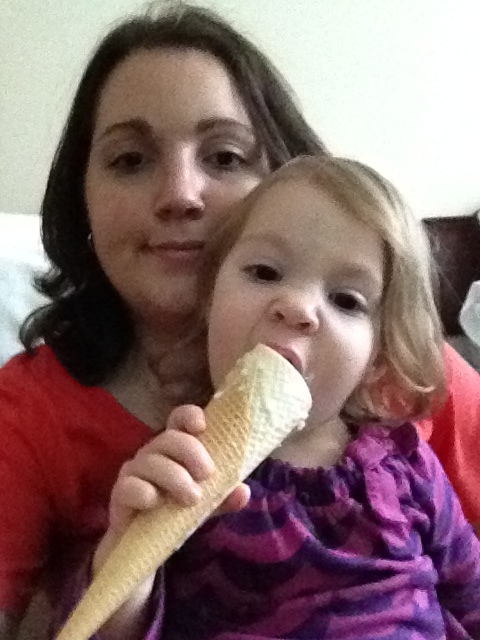 I had a cone of chocolate marshmallow and cookie dough, and all I can say is YUM. 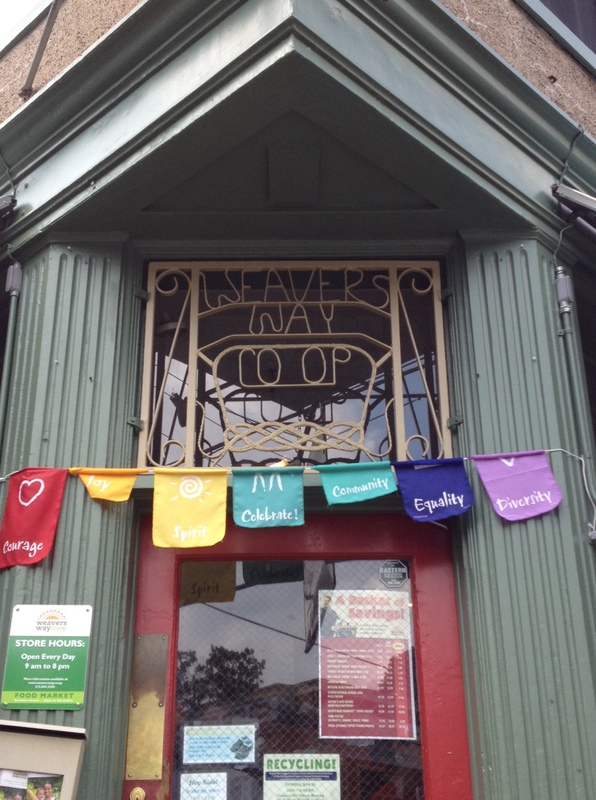 I wish I lived in Philly, I would hang out at this place all the time. 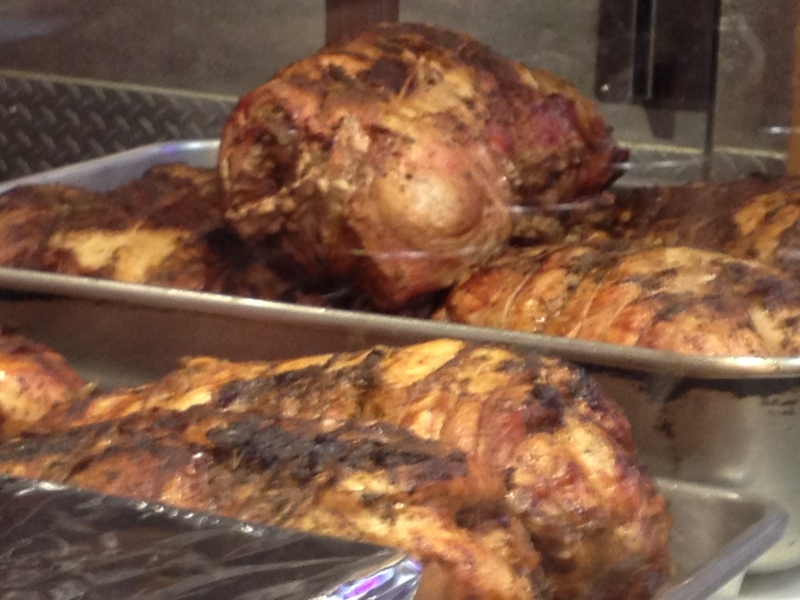 We had breakfast at Smucker’s Quality Meats. They are an Amish shop that serves mostly sandwiches. I ordered an egg and cheese sandwich, which I tried to share with Baby Beez (she preferred to throw it on the ground). 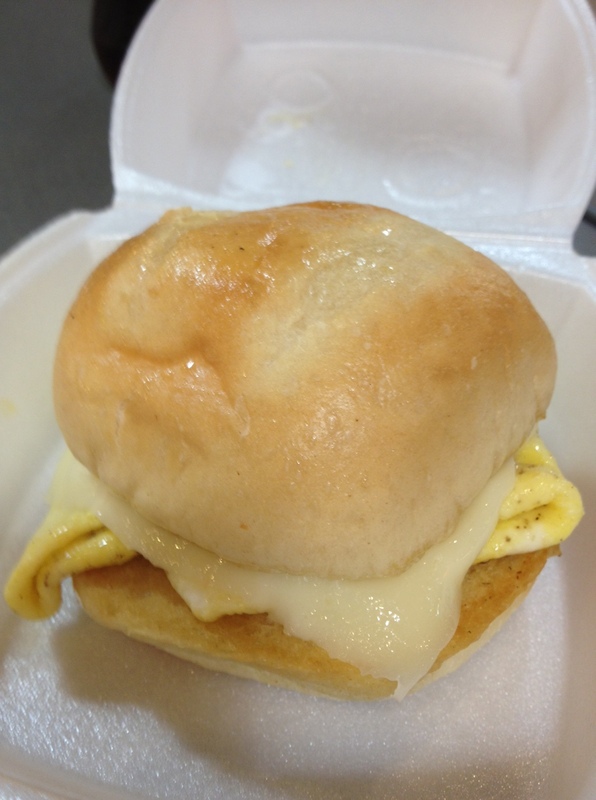 Although the egg and cheese were standard issue, the bun was buttery, fluffy and delicious. 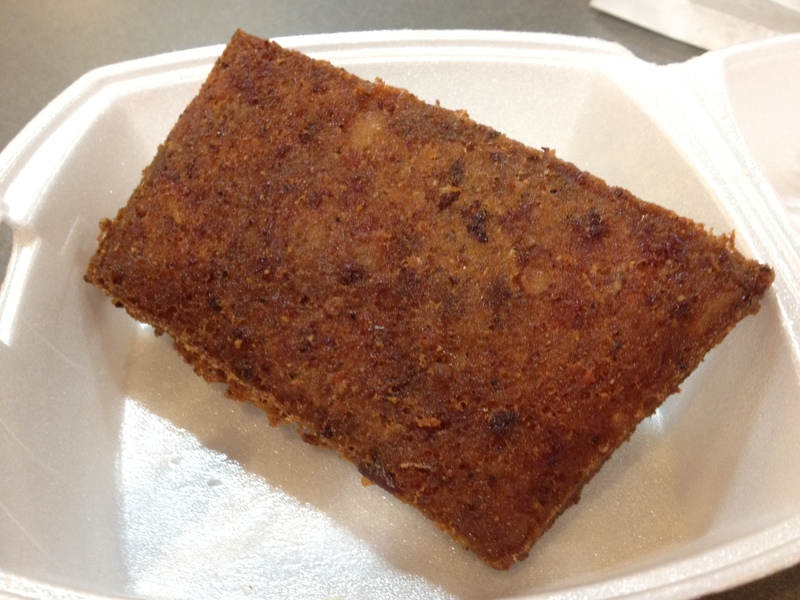 I know that scrapple has some die-hard fans, so I was excited to try it. I’m all for deep fried greasy meat dishes (see: my unflagging adoration of corn dogs) but I just could not like this. It was much too greasy for me. Maybe it would have gone better if I had ordered it inside a sandwich, so that the bread could absorb some grease, instead of as a side, but my first taste of scrapple won’t have me rushing back for more. 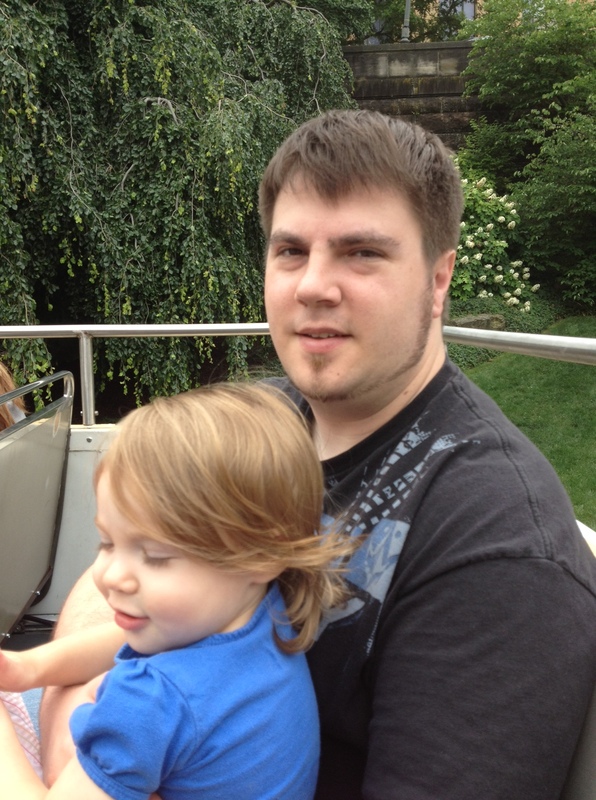 After breakfast, the beastie (and I) took much needed naps, and then met up with my dear pal Aubrey for a trip to Philly’s Please Touch Museum. 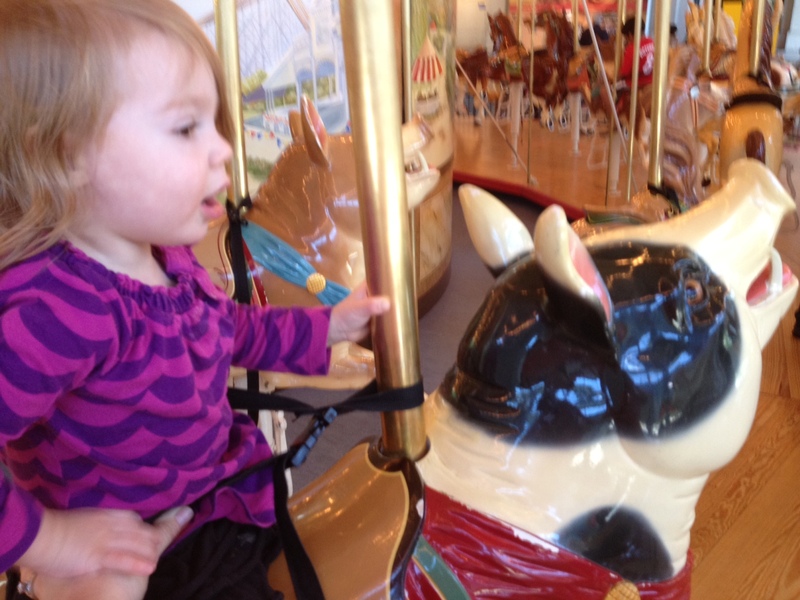 After our somewhat disappointing trip to Cleveland’s children’s museum, I was bracing myself for the unexpected, and not getting my hopes up too high about the museum. Folks, I had nothing to worry about. This museum is phenomenal. It is enormous, and beautiful, and creative, and all those things that make a kids’ museum perfect. From what I saw, it does not have a nursery area, so this museum is best for kids aged 18mos-10 years, but we spent quite a long time there and (had we not grown weary) could have been there much longer. 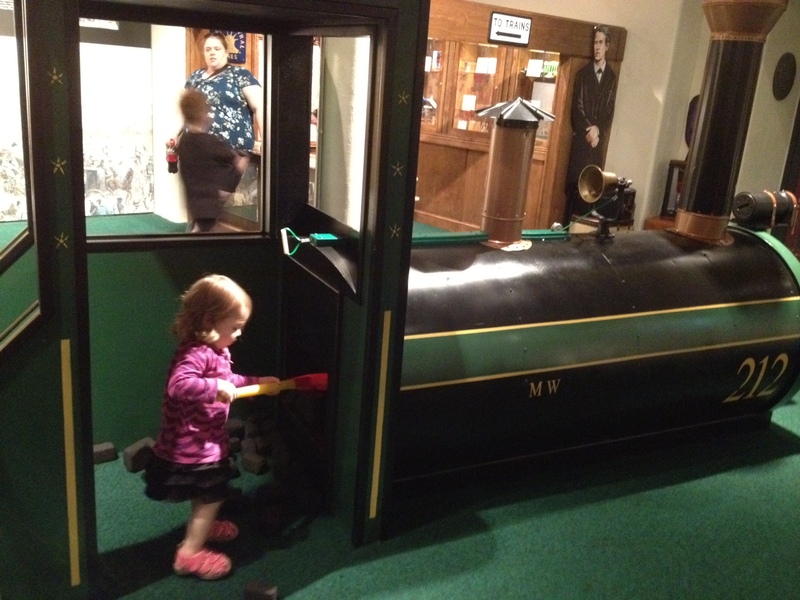 Shoveling coal for the train in the Philadelphia Centennial Exhibit. I only managed to get pictures of Baby Beez in a few exhibits, because there was so much to do and she was having so much fun, that every time I went to take a picture, she’d dart off to the next activity before the shutter clicked. 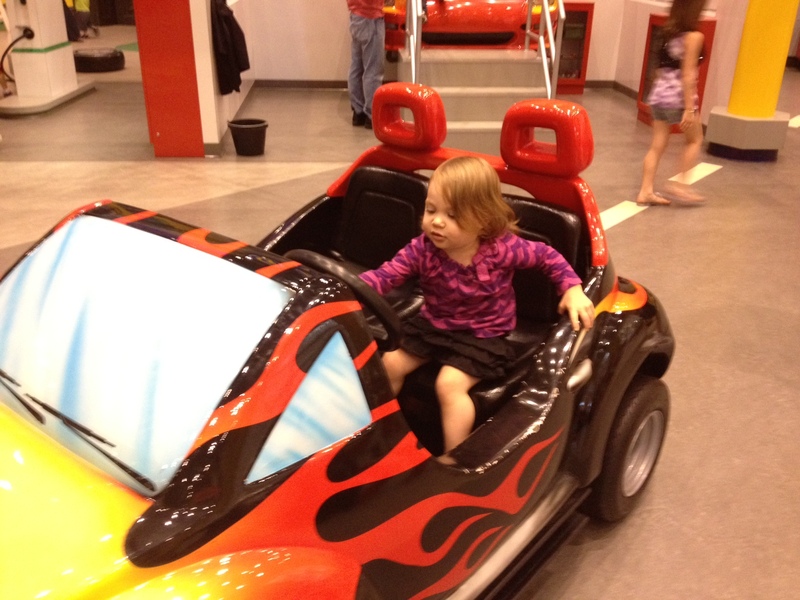 Every kind of exhibit you could imagine for a kids museum, they pretty much have. There is a car/garage exhibit, a rocket room, water tables, a rainforest music exhibit, a nursery rhyme exhibit, an Alice in Wonderland exhibit, and tons more. After our museum adventure, more resting was definitely in order. 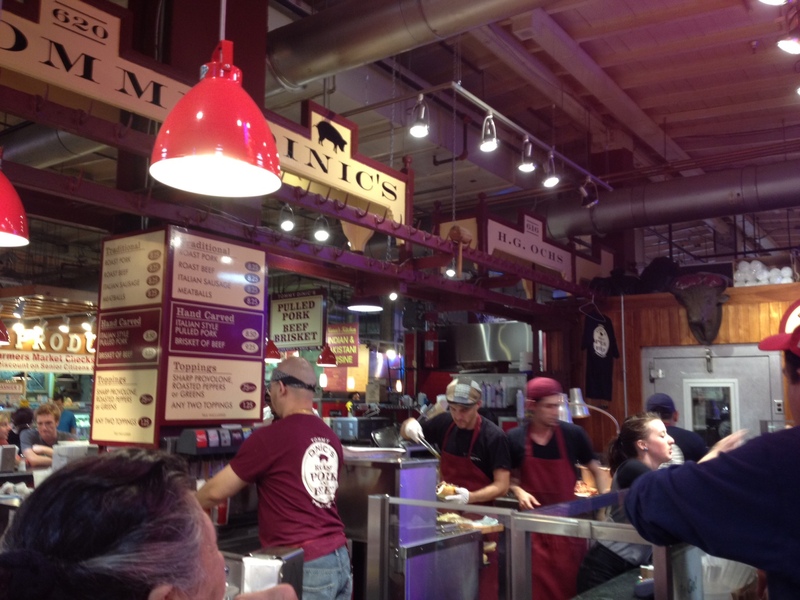 After some time, hunger crept in, and I snuck back over to Reading Terminal Market for a not-so-snack-sized snack from DiNiC’s. 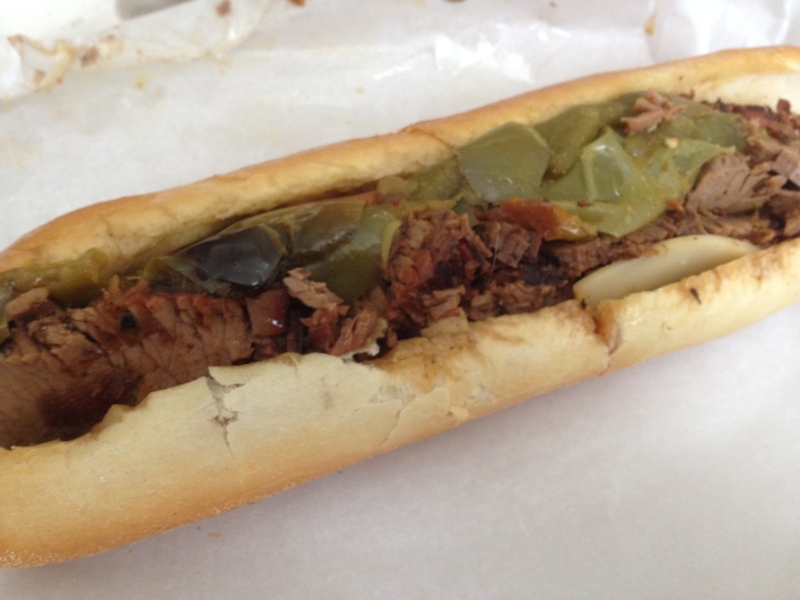 I had the brisket with sharp provolone and grilled sweet peppers. Mr. Beez had a very satisfying DiNic’s roast beef sandwich earlier in the week, and he was eager to hear my thoughts on my sandwich. All I could muster was “I WANT TO MAKE OUT WITH THIS SANDWICH.” Yes. That good. In fact, I’m thinking of sneaking back over there for another one before we leave tomorrow. 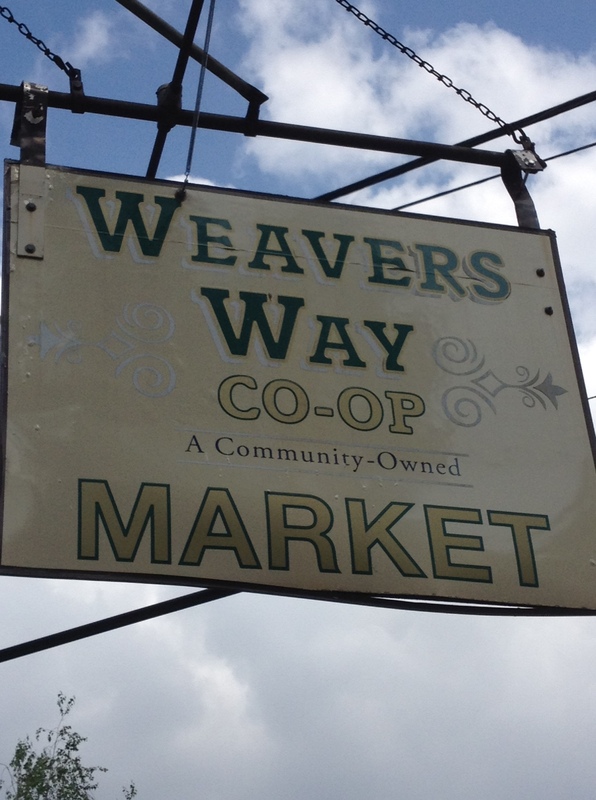 The meat and peppers and bread were all absolutely perfect. I was a little disappointed during the first few bites that the provolone was cold, not melted. But a few more chomps in, the tangy aftertaste from the sharp provolone set in, and it was delicious. Want more sandwich. Later in the day we also took another walk around the City. As we were about to head back to the hotel, I remembered that I read good remarks about Capogiro Gelato in the hotel’s magazine (which is probably the point of those magazines anyway), and since it was nearby, I wanted to go. 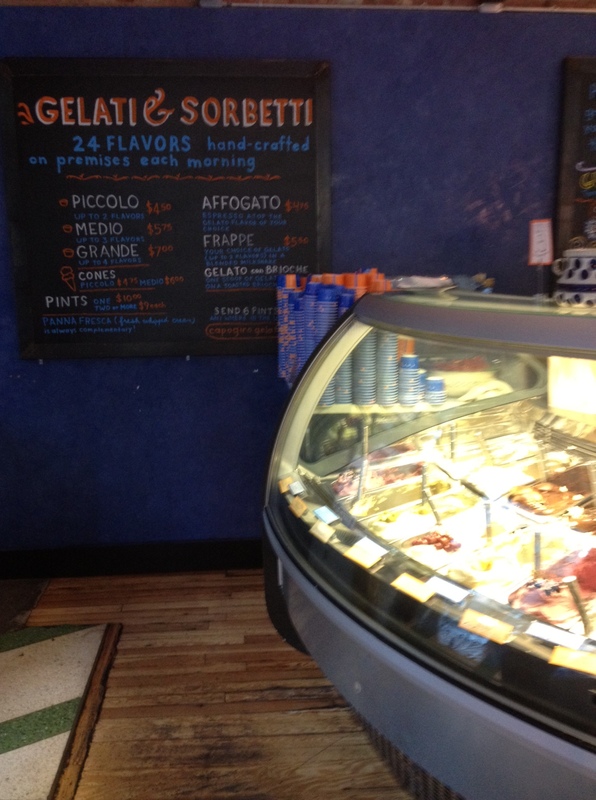 Like most gelato places, it’s pricey. A small starts around $4.50. The flavors of gelato are stronger than the flavor of ice cream, though, so a small serving goes a long way. Mr. Beez and Baby Beez went for the Amish Sweet Cream gelato, which they both enjoyed. I had Stratciatella (when it’s gelato, “chocolate chip” is just too commonplace a name) and Burnt Sugar. The Burnt Sugar was very tasty, and tasted just like the caramelized top of a creme brulee. I only wish that the gelato had little crunchy sugar bits mixed in, that would have made it amazing. The gelato was quite good, but I have to admit that I prefer hard ice cream over gelato. Maybe it’s because I hate hazelnuts and hazelnuts tend to sneak in to all the chocolate variations of gelato. Or maybe it’s because gelato melts too fast for my taste. In any event, if you really like gelato, you’ll probably enjoy Capogiro, but I’ll get my ice cream fix over at More than Just Ice Cream.